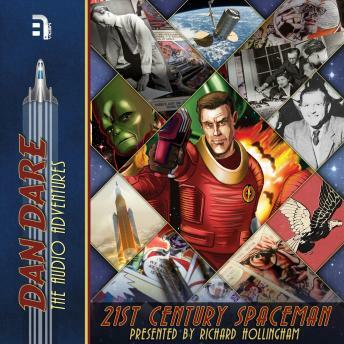 This fascinating feature documentary is an excellent companion piece to Season One of the critically-acclaimed Dan Dare Audio Adventures released by B7 Media. Science journalist Richard Hollingham explores whether the reality of space exploration is catching up with the Dan Dare universe. Featuring interviews with the cast, director and lead writer about re-inventing Dare for the 21st century, Richard even meets a real rocket scientist who owes his career to the pilot of the future. Dan Dare: The Audio Adventures © B7 Enterprises Limited 2017. Dan Dare TM © Dan Dare Corporation Limited 2017. Dan Dare word mark and logo are trademarks of the Dan Dare Corporation Limited and are used under license. The moral right of the Dan Dare Corporation Limited and B7 Enterprises Limited to be identified as having paternity of this work has been asserted. All rights of the manufacturer and owner of the recorded work reserved. Unauthorised public performance, broadcasting and copying of these digital recordings is prohibited.